Rosacea: What are the Symptoms, Triggers and Best Treatments? 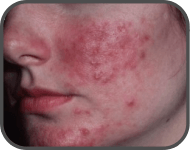 If you have heard of Rosacea, chances are you are already suffering with it and while Rosacea is not curable, don’t become disheartened just yet! There is much you can do to manage this skin condition and it starts with having a good understanding of the signs and symptoms of Rosacea as well as causes and common triggers. With a new understanding, we will also explore some treatment options that will have you controlling your Rosacea, not your Rosacea controlling you! Rosacea is a chronic inflammation of the facial skin. Although almost anyone can develop Rosacea, most Rosacea sufferers are fair-skinned women between the ages of 30 and 60 with a family history of Rosacea. 5% of fair-skinned people suffer from this unpleasant condition. However, it can also affect Asian and Middle-Eastern complexions. The most common sign of Rosacea is redness of the nose, cheeks, forehead and chin that may come and go. The skin becomes red and flushed with a visible, fine network of blood vessels often showing through the skin. Pus-filled bumps often develop and this causes many sufferers to mistake it for ordinary acne. It is predominantly found in people who blush readily or whose skin becomes flushed easily. In addition, it is characterized by hyper-sensitivity to factors such as touch or sunlight. The blood vessels in the skin dilate and cause redness. Some people believe that this is as a result of sensitive skin, but in fact, it is the blood vessels rather than the skin itself that over-react to stimuli. In some cases, the skin of the face develops red, flushed patches that persist for long periods. Inflammatory Rosacea is characterized by outbreaks of pus-filled spots. If you experience regular outbreaks of spots coupled with flushing of the skin, you may be suffering from this form of Rosacea. The development of vascular Rosacea is a distressing symptom that affects many Rosacea patients. In this instance, the blood vessels in the skin of the nose and cheeks become dilated and visible. The skin may become swollen and blotchy and the uniformed are likely to believe that this is a symptom of alcohol abuse rather than a medical condition of the skin. Rhinophyma may develop in severe cases of Rosacea. This condition is characterized by an enlarged and bulbous nose as a result of thickening of the skin. A famous renaissance painting by Domenico Ghirlandio depicts a man with advanced rhinophyma as evidenced by a lumpy-looking, bulbous nose. This symptom is rare and is more often found in men than in women. Ocular Rosacea is experienced by about 50% of those affected by Rosacea. The eyes become swollen and bloodshot and feel sandy. Those affected by ocular Rosacea find that they become more susceptible to conjunctivitis and are unable to wear contact lenses. Swelling of the face is common in Rosacea sufferers. The lymphatic system becomes unable to cope with the protein and fluids that drain from the engorged blood vessels. No-one knows what the specific cause of Rosacea is, however several theories have been formulated and certain valid observations have been made. ⇒ Some dermatologists believe that some sort of abnormality of the blood vessels is to blame given that dilated blood vessels are always associated with Rosacea. However, they are mystified as to what the specifics of the postulated abnormality may be. ⇒ It is a known fact that those with fair skin are more prone to Rosacea. ⇒ Demodex folliculorum, a microscopic mite that lives on everyone’s skin but tends to occur in higher numbers on the skins of Rosacea sufferers presents a tantalizing ‘chicken or the egg’ scenario. Do Rosacea sufferers have more of these mites because of Rosacea or are they a cause of Rosacea? Nobody knows the answer. ⇒ Helicobacter pylori, usually found in the digestive system, presents another unsolved conundrum. It is known to cause dilation of blood vessels and may be implicated in the development of Rosacea, but this is still unproved. ⇒ It could just be that Rosacea is caused by our genetic composition since 30 – 40% of Rosacea sufferers have family members who also have Rosacea. If this is the case, we still have a mystery to solve, since no-one knows what gene might bring about Rosacea. Most Rosacea sufferers have regular ‘outbreaks’ of Rosacea and a host of possible triggers have been identified. Among these are anything that promotes sweating, for example, hot or spicy foods, hot baths, hot weather, saunas, vigorous exercise and sunlight. However, caffeine, dairy products, stress and windy conditions are also on the list of possible triggers. 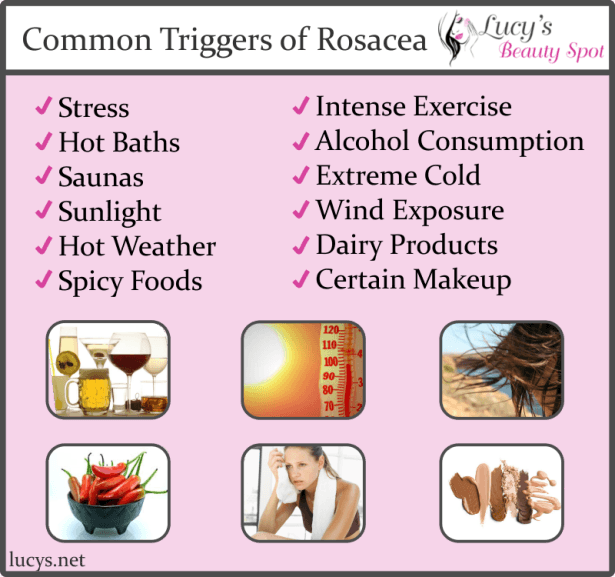 Alcohol is on the list, but remember, it is a trigger rather than a cause of Rosacea. There is no absolute cure for Rosacea, however a variety of strategies can be applied in order to reduce the severity of symptoms and reduce the regularity of outbreaks. Topical (external) treatments such as this Rosacea cream are recommended by many doctors. The product should contain anti-inflammatories as well as anti-bacterial agents. In severe cases of Rosacea, a doctor may prescribe oral antibiotics. However, frequent courses of antibiotics are known to adversely affect one’s health and may lead to resistance when treating other ailments. This drug has potentially dangerous side-effects, so it is only prescribed in acute cases of Rosacea and the patient is carefully monitored throughout the treatment. Eye-drops containing this steroid are sometimes prescribed for those suffering from Ocular Rosacea. Use should be discontinued as soon as possible. As with Blephamide, this is a prescription drug for the treatment of Ocular Rosacea. This medication has been linked to birth defects in infants and should not be used by pregnant women. Pulsed laser light is used to constrict dilated blood vessels lessening the appearance of Rosacea. Although the treatment is relatively painless, there is a possibility of complications and infection. In advanced cases of Rosacea where the skin has thickened, the puffy, bumpy areas can be treated with plastic surgery in order to improve appearance. Revitol Rosacea Cream Review: Will it Work For You?